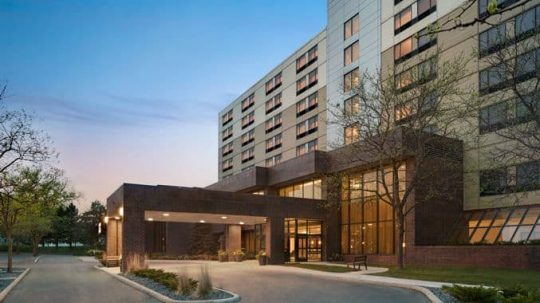 Welcome to DoubleTree by Hilton St. Paul East, conveniently located off I-94 and 5 minutes from the heart of Downtown St Paul. The hotel is situated 0.1 mile from the 3M Campus and Global Headquarters. Other major companies such as Travelers Insurance, Ecolab, Comcast, and Securian Financial Group are just 5 miles from hotel. Explore the capital city with its nightlife, restaurants, shopping and local attractions. Getting there is easy with our complimentary shuttle service to destinations within 10 miles of the hotel. Grab a warm DoubleTree chocolate chip cookie at check-in and settle into a freshly renovated guest room with complimentary WiFi, a 50-inch TV, mini-fridge, microwave, coffeemaker and large desk. Need extra space? Suites are great for families, offering a separate living area, sofa bed, extra seating and more storage space. Enjoy tasty meals without even leaving our St. Paul hotel. McKnights Bar & Grill serves American favorites all day – with the option to have it delivered to your room – and our lobby convenience shop is open 24 hours for snacks, drinks and travel items. Kick back after a long day in our heated indoor pool, whirlpool and fitness center. Along with a 24-hour business center, our DoubleTree St. Paul East hotel offers the perfect event space for meetings and celebrations of up to 500 guests. Plan work functions and wedding receptions in our newly refurbished conference center with the assistance of our expert hotel event planners. 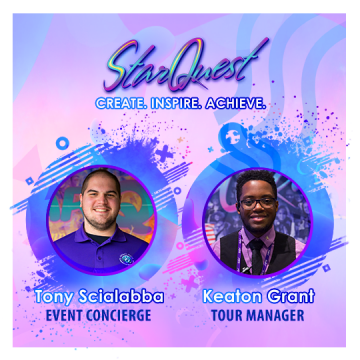 Contact Information Doubletree by Hilton St. Paul East 2201 Burns Avenue St. Paul, MN 55119 651-731-2220 StarQuest Rates Info $109.00 Book your room HERE: StarQuest Friends & Family OR by calling 651-731-2220 and tell them you’re with the “StarQuest International Friends & Family” group and give them the Group Discount Code: “SFF”. Available until April 23rd. The brand new Hampton Inn & Suites Downtown St. Paul hotel is located right in the heart of Saint Paul, Minnesota, conveniently across the road from the Xcel Energy Center and Convention Center. Headquarters for many top businesses including Ecolab and 3M are also situated nearby. Take advantage of our stylish hotel’s close proximity to the downtown area with its terrific shopping and dining options, and visit the beautiful Cathedral of St. Paul. Our elegant, modern guest rooms feature fantastic home comforts including free WiFi, comfy bedding and a movable work desk. Treat yourself to a stay in one of our suites and enjoy even more space, added amenities such as a full kitchen, and delightful views of either the river or cathedral. Ideal for small to mid-size corporate and social events, our flexible meeting space can hold up to 100 guests. Work out using the modern equipment in our fitness center, check emails in the business center, or take a refreshing dip in the heated indoor pool. A free hot breakfast is served every morning of your stay at Hampton Inn and Suites Downtown St. Paul. Pick up a variety of snacks, frozen meals and toiletries from our 24-hour Hampton Market. Bennett’s Chop & Railhouse, Rooster’s BBQ Deli and Green Mill Restaurant & Bar are all popular local restaurants. Contact Information Hampton Inn & Suites Downtown St. Paul 200 7th Street West St. Paul, MN 55102 651-224-7400 StarQuest Rates Info $119.00 Book your room HERE: StarQuest International Friends & Family Available until April 23rd.